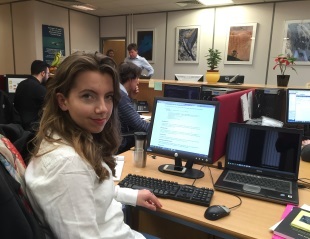 Laura White, a computer science student, is spending four months at the CAS office in Edinburgh as part of the scheme aimed at women studying science, technology, engineering or maths subjects at Scottish universities. Called CareerWISE, the initiative was launched by Equate Scotland in 2014 and this is the third time CAS has been involved. Laura will work on developing our web services framework, with the aim of enabling customers to more easily integrate other applications and services with Workpro. Chris Ellis, Chief Technical Officer at CAS, says, “We are very keen to support students who are interested in STEM jobs and it would be great to see more women choosing this sort of career path. Currently about a third of our technical staff are women, which is considerably higher than the average for companies in this sector where unfortunately numbers of women are still very low. CareerWISE provides high quality paid placements that develop both technical and other skills desired by recruiting employers, such as self-management, organisational and communication skills.